I’ve always been a British history buff and during a visit to London when I was 18, I went on one of those “Ripper Tours” where they take you to the sites of the Ripper murders. The tour guide decided to use me as the model to show the rest of the tour where the Ripper, well, “ripped” up his victims. At the time, I found the experience understandably creepy, but years later I believe it spawned my early interest in the infamous crimes. The idea to write a book about “Jack the Ripper in love,” however, came from repeatedly viewing the crime scene photos of the corpse of Mary Jane Kelly. So many aspects of her murder differed widely from the other “Ripper murders” – or at least the five canonical murders most expert Ripperologists agree were the handiwork of the faceless, nameless terror nicknamed “Jack the Ripper.” She was murdered indoors, in her own living quarters, and it’s generally accepted that she quite willingly brought her killer to the scene of her horrible demise. She was younger and more attractive than her predecessors. Her death was more gruesome than the others. The Ripper took the time to do to her what he wasn’t able to do to the rest, or so it appears. He literally dissected her like she was some kind of hideous experiment. All of the aforementioned details combine to paint a picture of her murderer as someone who had a personal connection with her. The obvious connection, in my view at least, is that he was in love with her and, perhaps, she spurned him. 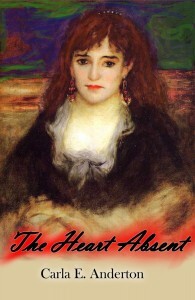 “The Heart Absent” is a historical horror novel with elements of romance and (I hope) elements of literary fiction. That’s my story and I’m sticking to it. “The Heart Absent” is “My Fair Lady” gone horribly wrong. “The Heart Absent” was published by New Libri Press in April, 2013. It is now live on Amazon Kindle! The idea for “The Heart Absent’ first occurred to me in 2003 but the bulk of it I wrote while enrolled as a graduate student at Seton Hill University. It was my thesis novel for my Master in Fine Arts degree. The following titles aren’t necessarily in my genre, but they definitely inspired me: Brett Easton Ellis’s “American Psycho” and Margaret George’s “The Autobiography of Henry VIII.” “The Heart Absent” fall somewhere roughly in the middle. I plead the Fifth Amendment. People who really know me will recognize part of the story as closely mirroring aspects of my own life. That’s all I’m going to reveal for now. The rest I’m saving for Oprah. “The Heart Absent” is a story about Jack the Ripper’s evolution from boy to man to monster, but there are many other topics tackled in the novel. I would like to think it’s also a parable of sorts about the consequences of controlling relationships. Some may consider parts of the novel to be irreverent in terms of religion. I did that on purpose. Finally, in spite of the rather dark subject matter, the novel is sprinkled with humorous one-liners and the strong ties of friendship between some of the major characters are certain to warm the cockles of your heart.